Planning a honeymoon? Here are a dozen destinations for a range of budgets based on recommendations from wedding and travel experts at The Knot and Expedia. Located along Italy's west coast, Tuscany is known for its lush green hillsides, romantic vineyards and decadent eats -- all qualities which TheKnot.com site editor Anja Winikka says make it a classic honeymoon destination. 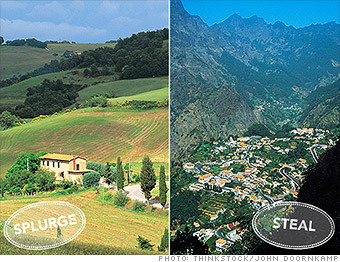 But thanks to its popularity with tourists, Tuscany is also classically expensive. For the romance of Tuscany with a much lower price tag try Portugal, another wine-loving country that has year-round travel deals. *Note: Expedia calculated average trip costs using package deals offered from New York City for the week of May 31 through June 7th.